Skunks are commonly found through all parts of North America, and are most widely known for their terrible odor that they emit as their first line of defense. 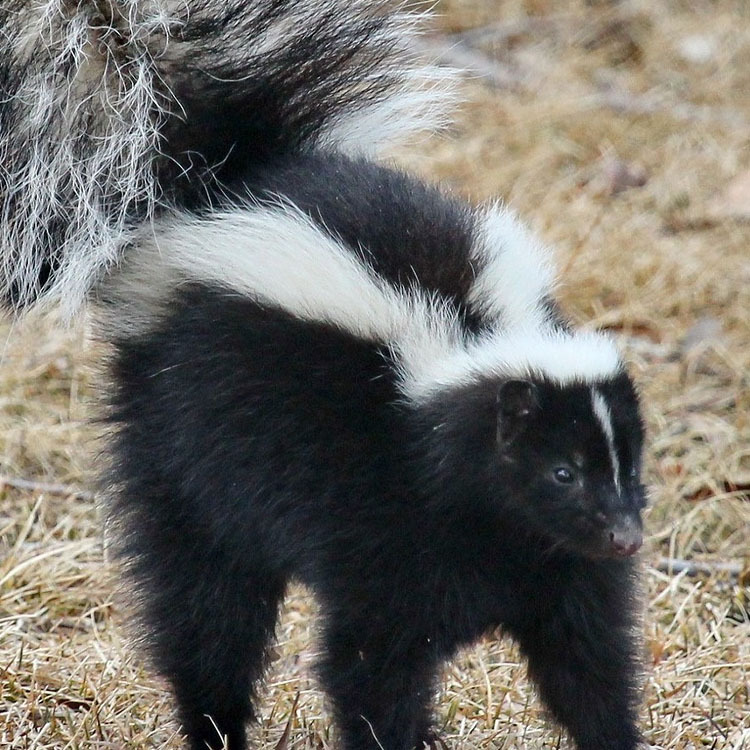 While skunks are not commonly aggressive by nature, most don’t want them around for fear that they or their belongings could get hit by the spray of the skunk. Most skunks seek out insects to munch on, however they are opportunistic creatures and will eat small animals and vegetables if they can manage to get their paws on it. They will often dig through the dirt to create burrows and to find food sources, they will also use these burrows during the winter months to huddle together and stay warm. You can often tell if you are having skunk problems by looking for tracks that they leave, you can identify 5 toes and claws on both the front and back paws. They will also knock over trash cans and raid gardens and chicken coops, however these can also be signs of other wildlife as well. You can also identify skunk activity by the odor that they leave behind, if they are frightened and spray near your home, you may be able to detect the smell. Skunks are a huge headache! Their odor can be nauseating and disorienting. If you have an unwanted skunk in the area, the best option to get rid of him is to attempt to trap him using a live trap. This is the most humane way to remove a skunk, as it keeps the skunk alive and give you the ability to relocate it to a more appropriate location where it can thrive. One of the reasons people are hesitant to go forward with this method of removal is the possibility of frightening the skunk and getting sprayed. There are ways to prevent this, such as making sure you’re completely covered and protected from the spray. You should also approach the trap slowly and calmly, this will keep the skunk from panicking too much and greatly reduce the likelihood of it spraying you. Use a blanket to cover the trap, skunks typically won’t spray if they cannot see what they are targeting. To reduce the chances of skunks even coming onto your property, you can install wildlife lights, which will turn on when a skunk comes close to the house; these bright lights will often deter skunks and other nocturnal animals from sniffing around your home. You can also install fencing around the yard, skunks are not known for being able to climb very well, however they can dig so you want to make sure that your fence goes under ground at least a couple of inches. There are several skunk repellents on the market, however, they are not proven to prevent skunks on their own, you may want to use them with other methods of deterrent.